Hi everyone! 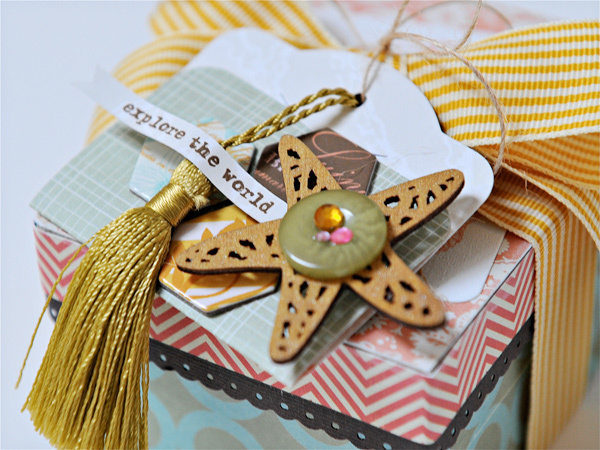 Not too long ago I was asked by the super sweet Julia Sandvoss to be a guest designer on the Glue Arts blog. They are teaming up with Pink Paislee all this week (and last) so of course I said heck yeah! Truth be told I had never used Glue Arts products before but after designing with them this past weekend I can say without hesitation that they are fabulous. I love the size of the Glue Glider Pro and the U Cut It Foam Adhesive is just perfect for a gal like me that is addicted to dimensional adhesive. I created this altered gift box using the brand spankin' new Nantucket collection from Pink Paislee and lots of Glue Arts adhesives. To see a complete supply list and read my step by step instructions for this project be sure to visit the Glue Arts blog. And while you're there check out another Pink Paislee project I created using the adorable Hometown Summer collection. gorgeous project!!! i would love to get something in such a pretty box!